Tucked away in the seaside town of Emerald Isle, North Carolina, you’ll find the family-owned restaurant, Rucker Johns. Inspired by the shoreline, the restaurant’s interior gleams with soothing cool colors and sophisticated textures. It’s a modern space, but Rucker Johns didn’t always look like this. 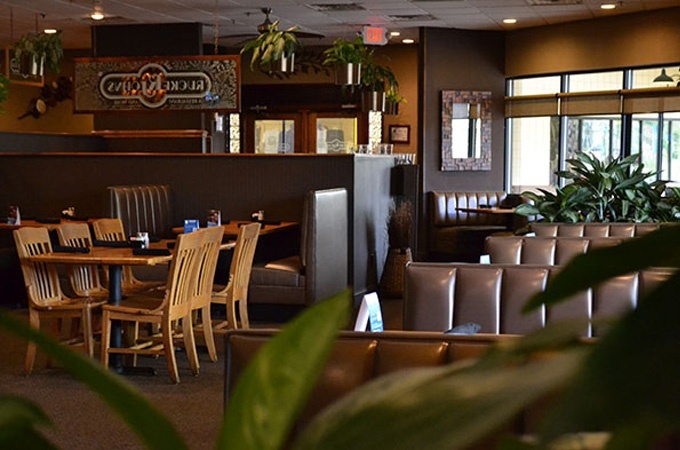 In fact, until recently, Rucker Johns was an aging casual restaurant in need of an update. 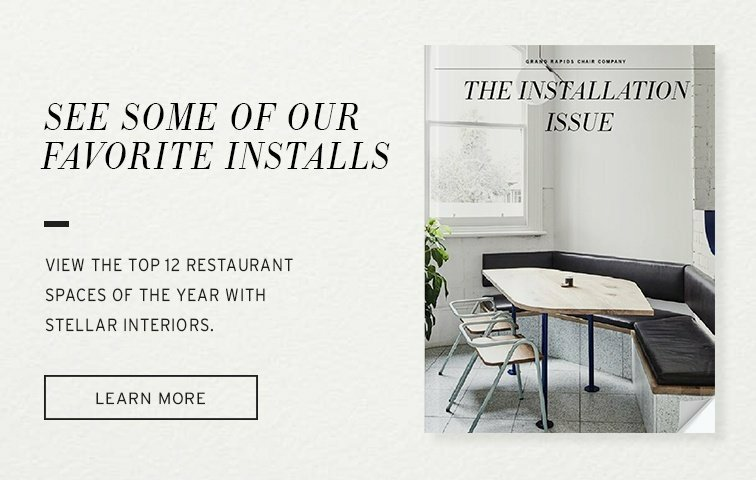 Curious about the design, we called up Danielle Boisse of Port City Design Group, the designer responsible for Rucker Johns’ new look, to learn more this massive makeover. To understand the scope of the redesign, it’s important to look at the history of Rucker Johns. Every year, thousands of tourists flock to Emerald Isle for beach vacations. And in the thirty-plus years of Rucker Johns’ existence, many of those tourists embraced Rucker Johns as a staple of their vacation. 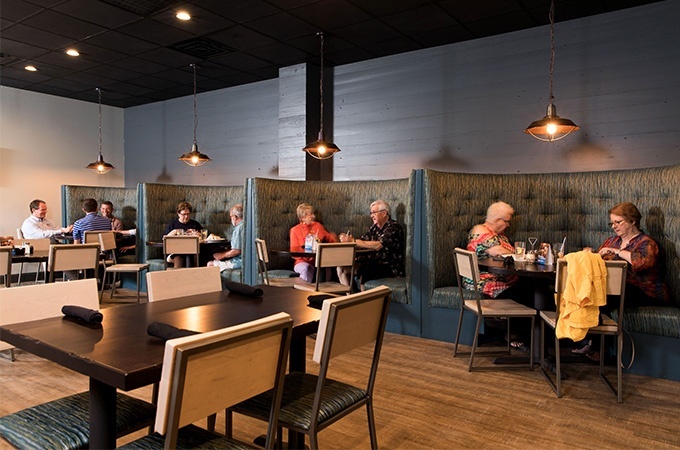 The family-friendly environment and simple comfort food made it an easy choice for diners to kick back and relax. 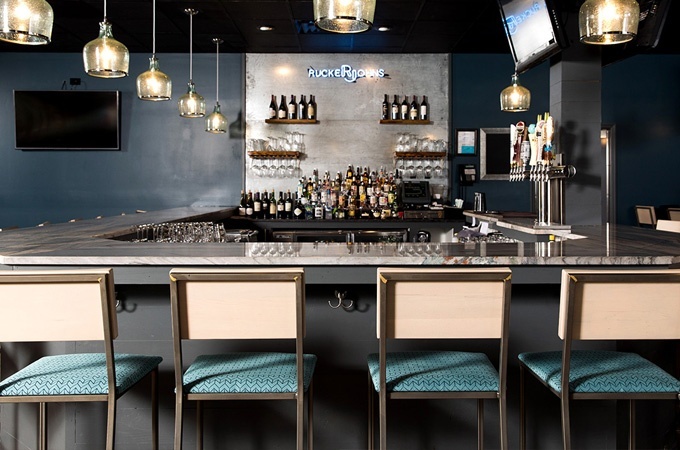 But with an older clientele and tired design, the owners knew the restaurant not only needed an update, but needed to attract a younger audience to sustain future business. 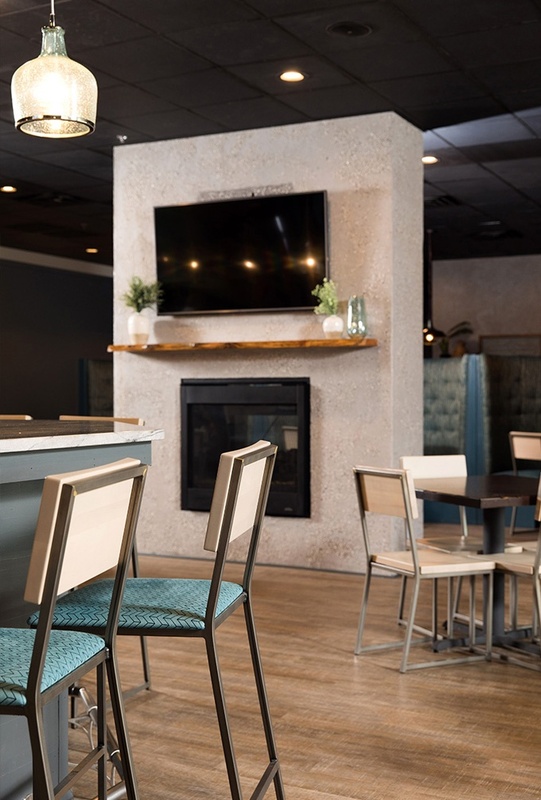 In order to do this, they enlisted the help of Danielle Boisse, owner and lead designer of Port City Design Group, to create an intimate atmosphere in the 7,000 square foot facility and to deliver a design that pleased both loyal and new guests. Boisse paid particular attention to how noise levels and open space affects the overall dining experience. With 275 available seats indoors and another 100 outdoors, creating intimate vignettes and personal space were key to Rucker Johns’ success. “It’s important, especially in large spaces, that customers can hear each other, and that there’s a sense of privacy. Curves are important, upholstery is important. Feeling warm and secure is incredibly important to the customer experience,” said Boisse. With vacation hot spots, it can be easy to go overboard with coastal-themed designs, but Boisse was subtle and strategic with her furniture and finish choices. 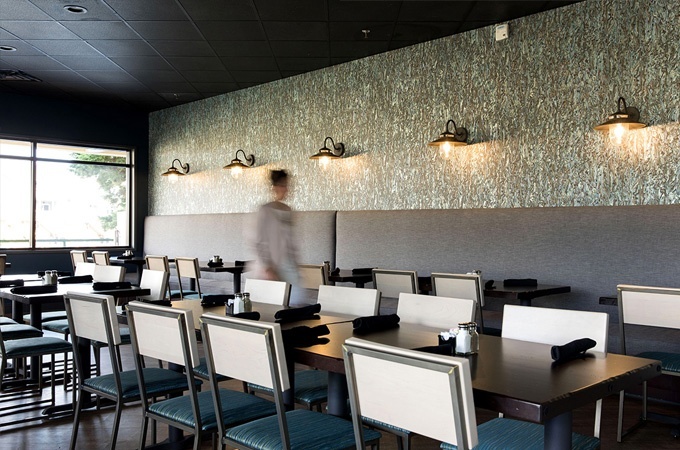 Instead of literal sea decor, she opted for sophisticated yet durable fabric on the chairs, barstools, and booths that have a seaweed-like pattern. That undulating marine-esque pattern is echoed on the wall coverings, which are grey and have a magnificent way of catching light. The two massive fireplaces (design centerpieces from the original design) were refreshed with a new facade of mixed concrete and local oyster shells. Muted blues, oyster-taupes, and browns round out the coastal-inspired color palette. Overall, the space is sophisticated, welcoming, and fresh. It’s a place I’d happily go with peers or parents—a balance rarely achieved in casual dining restaurants. Brady Barstools and Chairs in clear coat finish show the natural discoloration of the metal due to welds. Since their recent opening, Rucker Johns has been filled with their loyal customers as well as new ones. Boisse created a fresh new look while maintaining that cozy, intimate atmosphere regulars came to know and love. With two other locations in North Carolina, we’re excited to see how this new design is received by customers of all ages.